Most people believe that coconut oil is a magical cure for all that afflicts you, eczema include. You might have heard that coconut oil can work wonders for eczema, especially atopic dermatitis. Some people think that coconut oil can reduce eczema flare-ups, soothe inflammation, and lower the risk of infection. Since eczema is a skin problem, some people try to fight it by applying coconut oil over the affected areas. Eczema happens when you have an issue with your epidermis – the top layer of skin, which should hold in adequate moisture to keep your skin hydrated and supple while also warding off bacteria and allergens. If you have eczema, a gene variation keeps your epidermis from doing its function. This problem leads to inflammation that causes eczema symptoms like dryness and itching. You may also have tiny, raised bumps that itch and weep fluid and crust over if you scratch them. Scratching can result to tender, extra-irritated skin, and even make you vulnerable to infection. For the most part, people with eczema do not experience these symptoms all the time. Instead, they tend to have flares when exposed to triggers like sweat, stress, soaps, detergents, dust, and pollen. Skin specialists have identified a lot of great eczema treatments to keep symptoms at bay, though coconut oil is not one of them. If your doctor diagnoses you with eczema, she will recommend the use of gentle skin care products and medications. Corticosteroid creams and anti-itch drugs help relieve inflammation and irritation. They may prescribe antibiotics if you have a skin infection. If you have eczema, it is also essential to moisturize your skin two to three times a day with non-allergenic creams. Some experts agree that coconut oil could help you with this, but not as a replacement for conventional treatment methods. Humectants – those that draw water into your skin. Occlusives – those that coat your skin’s surface and reduce water loss. Emollients – those that make your skin soft. Oils are occlusive and emollient, meaning they will sit on top of your skin and work to prevent moisture from escaping. Coconut oil seems to have moisturizing properties. However, since oil is not a humectant, it does not deliver moisture to your parched skin in the way other moisturizers do. In theory, that would make coconut oil work best when layered on top of a humectant that will draw moisture into your skin’s surface. Also, if you are on into coconut oil, it can be quite messy to apply. 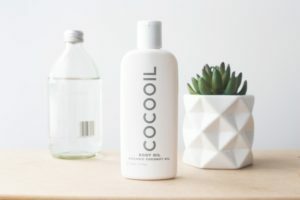 Coconut oil can become solid at colder temperatures, but when your hands warm it up before applying it to your skin, it will get runny in no time. It is better to use thicker moisturizers instead of coconut oil since they are generally known to provide more hydration. There is also the potential issue with food allergies. People with eczema are more likely to have them, so rubbing coconut oil onto your skin could be setting yourself up for an allergic reaction. Finally, if you are acne-prone, you should take a pass on coconut oil. It is comedogenic, which means it could block your pores and cause a breakout. Even if your skin does not have a natural inclination toward acne, having eczema may make your skin more sensitive. Try patch testing by placing a small amount of coconut oil to your inner arm. For a week or so, gauge your skin’s reaction to the coconut oil. This entry was posted in Eczema and tagged atopic dermatitis, eczema, great eczema treatments, skin problems. Bookmark the permalink.